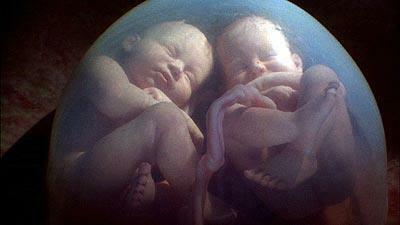 In a mother’s womb were two babies. One asked the other: “Do you believe in life after delivery?” The other replies, “why, of course. There has to be something after delivery. Maybe we are here to prepare ourselves for what we will be later. “Nonsense,” says the other. “There is no life after delivery. What would that life be?” “I don’t know, but there will be more light than here. Maybe we will walk with our legs and eat from our mouths.” The other says “This is absurd! Walking is impossible. And eat with our mouths? Ridiculous. The umbilical cord supplies nutrition. Life after delivery is to be excluded. The umbilical cord is too short.” “I think there is something and maybe it’s different than it is here.” the other replies, “No one has ever come back from there. Delivery is the end of life, and in the after-delivery it is nothing but darkness and anxiety and it takes us nowhere.” “Well, I don’t know,” says the other, “but certainly we will see mother and she will take care of us.” “Mother? ?” You believe in mother? Where is she now? “She is all around us. It is in her that we live. Without her there would not be this world.” “I don’t see her, so it’s only logical that she doesn’t exist.” To which the other replied, “sometimes when you’re in silence you can hear her, you can perceive her.” I believe there is a reality after delivery and we are here to prepare ourselves for that reality…. There once was a little boy who wanted to meet God. He knew it was a long trip to where God lived, so he packed his suitcase with Chocolates and a six-pack of Coke cans, and he started his journey. When he had gone a short way, he met an old woman. She was sitting in the park just staring at some pigeons. The boy sat down next to her and opened his suitcase. He was about to take a drink from his suitcase when he noticed that the old lady looked hungry so he offered her a Chocolate. She gratefully accepted it and smiled at him. Her smile was so pretty that the boy wanted to see it again, so he offered her a drink. Once again, she smiled at him. The boy was delighted! They sat there all afternoon eating and smiling, but they never said a word. -Guru Raam Das Ji, the fourth Sikh Master. The boy saw the bottle and playfully went to the bottle and, fascinated with its color, drank it all. It happened to be a medicine meant for adults in small dosages. When the child collapsed, the mother hurried him to the hospital, where he died. The mother was stunned. She was terrified how to face her husband. The husband’s totally unexpected reaction is proactive behavior. The child is dead. He can never be brought back to life. There is no point in finding fault with the mother. Besides, if only he have taken time to keep the bottle away, this will not have happened. No point in attaching blame. She had also lost her only child. What she needed at that moment was consolation and sympathy from the husband. That is what he gave her. Take away all your envy, jealousy’s, unwillingness to forgive, selfishness, and fears and you will find things are actually not as difficult as you think…!!! 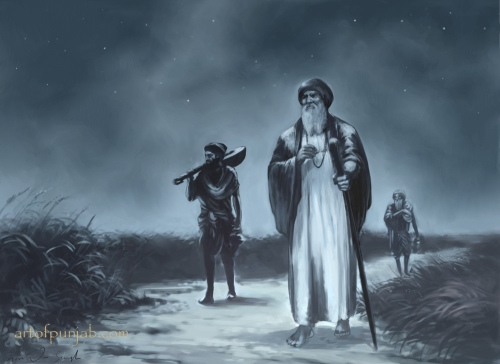 A short story to commemorate the birth anniversary of Guru Nanak Dev ji, the founder of the Sikh Faith. I woke up earlier than usual on darshan day. The time must have been a little after midnight. Something seemed different that day. With difficulty I lifted my head and peeped out of the small window of my hut. Although I could not see anything due to the pitch darkness of the night, I sensed some activity in the trees. I closed my eyes and listened. To my surprise I sensed the trees were in the same jovial mood as they were when spring was approaching. Winter had just started, it would be months before even the slightest hint of spring. I lay down my head back on the pillow and realized that I too was in a jovial mood – my heart too hinted some hope and excitement. That was quite a change from the past few years of my miserable and painful existence. It had been almost twenty years ago that I had been diagnosed with an incurable form of leprosy. This had been the first such case in the memberable history of my village and the people did not know what to do with me. I had been quite a cheerful and promising young boy before the village doctor noticed the state of the perpetually open wounds on my back. 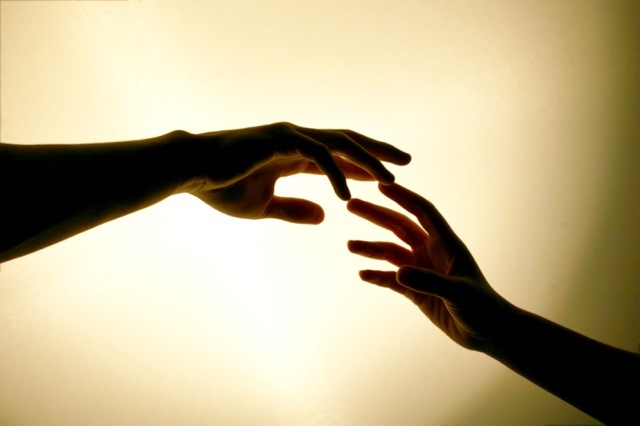 After he announced my disease, my life changed drastically. The elders banished me despite my family’s (particularly my mother’s) heart breaking pleas. My brother and uncles built a hut for me three miles from the village and promised me daily visits. At first, all my relatives and friends came each and every day, and brought me gifts and tried their best to lift the dark and heavy depression that was suffocating me, but due to my negative and cynical view (and because love is rarely true amongst worldly people), the number of people visiting me reduced to one – my mother. She would bring food for me two times a day. She would come and clean my hut, bathe and feed me. At first, I eagerly awaited her visits. I asked her about all my friends. But gradually, it only pained me to listen to her. Soon after, I started bolting the door and would ask her to leave the food outside and go away. I also asked her to come only once a day since I realized it was hard for her. With much reluctance, she agreed, but she could not understand my isolation from her. This continued for over ten years. My condition was only getting worse. Although I was in my early twenties, I felt like an old man. Laying all day in bed and being angry and depressed had certainly taken their tolls. I had a hard time even going to the nearby river to get my supply of water. My bones would groan and creak at every effort. My mind had turned into a dull and a stagnant vessel which would not hold any thoughts except for the immediate bodily needs. Then one day things changed. My mother was taken seriously ill with tuberculosis. Even in her illness, she prepared food for me, but she did not have enough strength to deliver it to me. She asked my nephew to accomplish that task. Consider it fate, but for reasons known only to my nephew, the food was not delivered to me. The first day without food, I cried like a baby and shouted out to my mother. I had tried to eat berries from a low hanging bush, but due to ignorance, had eaten poisonous ones. This only made the situation worse. After three painful, lonely and sleepless days I assumed my mother was dead and I would never again see another human. I decided to end my life. It was the middle of the night and death seemed like an inviting and pleasant escape. I slowly and painfully got up from the bed and made my way towards the river. I envisioned myself jumping in and drowning. I had made it half-way to the river-bed when I tripped on a bush and fell heavily on my face. Due to my general poor health and lack of food, I could not lift myself up again. Only with a tremendous amount of effort, I turned and lay on my back. Miraculously, I fell asleep. In that wonderful sleep I dreamt that a man with a beard and a blue piece of cloth wrapped on his head took my hand and led me to two big doors. Although I could no see the man, he appeared to radiating grace and elegance. With his hands he pushed open the doors. A ball of white light immediately engulfed me and with a jerk lifted me a few feet out of my body. The jerking movement woke me up. I was breathing slowly and deeply. I felt light and joyful. To my joy, I realized I was still hovering slightly above my body. I had heard several times from the village pundits that the soul was an entity distinct from the body, but I had given it as much thought as I suspect they did. But that day in an instant my life changed. I cannot express the relief I felt at the thought that this deformed and rotten body was not me. Since then, my life had revolved around getting that sensation back. I have tried all the methods that I have heard about to gain that light feeling. But even though I have become still inside, and can listen to myself and nature more easily, that wonderful feeling never graced me. Most of my days were still spent drowned in thought and depression. But that darshan day felt different. I couldn’t go back to sleep no matter how hard I tried. Finally at dawn, I got out of bed and looked out of the window. The sun had just risen making everything golden. The birds and the wind were joyfully singing songs of love. I stood there for a long time bathing in freshness. And for the first time in about twelve years I decided to go for a walk during daylight. I was an avid walker once but the horrified looks of a boy who had accidently seen me had locked me inside. But that day, all that didn’t matter. I felt a trace of life in me. I spent the whole day seeped in nature and waiting for something to happen. At the end of the day, I was more surprised than disappointed that nothing had happened. I lay on my bed and dozedoff. In my dream, the same man with a blue turban appeared again. This time he held me by my hand and took me to the river. He signalled me to go into the water. I went in. I looked at my reflection in the water and with a shock realised that I had been cured. I looked for the man but he had entered a hut. I ran and knocked on his door. No answer. I knocked again… With a start I woke up. Someone was knocking at my door. I opened the door and saw a sight that filled me with wonder and awe. There stood a middle-aged man at the door. He had a small bundle of what appeared to be books and clothes on one shoulder, and a box which appeared to be a case for a musical instrument on the other shoulder. And a few steps behind him, stood the man from my visions. He was wearing a yellow robe, wooden slippers and a blue turban. Although His robe was faded and old, He looked like a king of all kings. Although His beard was mostly white, His face was filled, nay, overflowing with youthfulness. Although His eyes were half-closed and hidden in the dark, a thousand suns could not match their brilliance; a thousand moons could not match their serenity; a thousand kings could not match their splendor. Instinctively I sank to my knees and bowed. Without a word they both entered my hut and sat on the bed. I was quite dumb-founded and tongue-tied. I just kept staring at Him. At times, I would quickly glance at His face, but it proved to be too intense an experience for me and I would quickly revert my glance back to His feet. I wanted to say words of welcome, I wanted to thank Him for being there, I wanted to ask for forgiveness for my sinful being, but my throat would not, could not form words. With His signal, the man with the instrument opened it up and started playing it. Ah, the wonderful music captivated me. Then He sang. The song entered me, nay, flooded and imprisoned me. I drank His song and lost my thirst. His song opened the dam of tears in me and I wept. With One note of His song, He gave me enough to fill my life, With one note of His song, I was drenched in bliss. With one note of His song, my thoughts ceased. With one note of His song, my soul separated from the pained and diseased body. He sang about light. He sang about darkness that enveloped me. He sang about the world within. He sang about sorrow-less and death-less truth. He sang about sorrows and death of untruth. He sang about becoming truth. He sang about merging within. He sang about the wonderful naam. He sang about the blissful naami. He sang about One, One, One…. After songs there was songs of silence. I was in freedom. My beard was literally drenched with tears of repressed emotions. Without a word, His companion filled a bowl he was carrying with water from my water pitcher and started reciting verses. Whereas the songs were rapped in love and longing, the verses were wrapped in wisdom and One’s greatness. I listened. I felt wise and clean. For the first time in my life I felt pure. At that time everything was pure, my clothes, my hut, the forest around. Blessed was my bed which was serving them – the angels of One. How fortunate was His companion. Throughout the songs and recitation the companion gazed at His face with an intent of a child looking at his mother. I found myself gazing at His companion’s face. Whereas His face was like the sun – much too bright for me – His companion’s face resembled the moon. It was quite a moment. I, staring at the moon, the moon staring at the sun and the sun focused on the One. The companion finished the verses, took the bowl of water to His feet and dipped His toe in the water. The companion motioned me to drink the water. To my surprise, it was sweet. I gulped it down. Never had I tasted such contentment. I felt intoxicated. I felt I belonged to Him and He to me. I felt His love, His grace, I felt Him in me. Sunlight on my face brought me back to this world. They had departed. A pain shot through my body at seeing the bed empty. For a moment I wanted to run and find Him, but the quietness of the trees told me they had gone far. Slowly I got up from the spot in which I had spent the whole joyful night. What a night, I thought; the trees were certainly justified in singing about spring. He was spring. For a brief moment I thought this was all a dream. Perhaps I was still in a dream. But instantly I realized this was real – on the bed lay a small book. With excitement, I picked it up. It was the verses His companion had recited. Although I didn’t know the language it was written in, I still could read it because it was in a language similar to one I knew. And the verses written were the same ones His companion had recited and they were deeply embedded within me. I quickly read the first page. I turned the page. My heart missed a beat. It wasn’t the book but the sight of my hand. It’s sores were dry. I carefully put the book back on the bed and with trembling hand and heart examined my body. Yes, all my sores were either dry or were getting dry. He had cured me. He, the angel of the One had cured me. He had come to my unclean abode and purified me. Tears welled up in me when I thought of His mercy. Me, a sinner’s sinner, an unclean, nay, filthy untrue animal had been touched by His grace. I bowed to the book, I kissed it and I lovingly pressed it to my heart.